On April 5th, 1807 Captain Folger sailed from Boston on a sealing voyage on the ship Topaz. It was to be a voyage of discovery, but not as he planned. “At ½ past 1 P.M. saw land bearing SW by W1/2 steared for the land. .. at 2 A.M. the Isle bore south 2 leagues dis. Lay off & on till daylight. At 6 A.M. put off two boats to Explore the land and look for seals. On approaching the Shore saw a Smoke on the land at which I was very surprised it [Pitcairn] being represented by Captain Carteret as destitute of Inhabitants, on approaching Still more the land – I discovered a boat paddling towards me. “This is the ship Topaz of the United States of America. I am the master, Captain Mayhew Folger, and American. “Aleck” (referring to John Adams, but who on the island was known as Aleck). Imagine Folger’s feelings when he realized that he was the first person in the world to find the location of the mutineers of the Bounty. (Not knowing only one mutineer survived), he invited “Aleck” onboard but the canoe returned empty. Folger realised that “Aleck” would not want to come on board as he was afraid he would be arrested and taken to England to be hanged. “I went on shore and found there an Englishman, Alexander Smith, the only person remaining out of the nine that escaped on board the ship Bounty. Smith informed me that after putting Captain Bligh in the long boat and sending her adrift, their commander – Christian – proceeded to Otaheiti,(Tahiti) then all the mutineers chose to Stop except Christian, himself and seven others; they all took wives and Six men as Servants and proceeded to Pitcairn’s Island where they landed all their goods and Chattles, ran the Ship Bounty on Shore and Broke her up, which took place around 1790 – soon after one man drowned himself another died with a fever, and after they had remained about four years on the Island their Men Servants rose upon and killed Six of them, Leaving only Smith and he desperately wounded with a pistol Ball in the neck, however he and the widows of the deceased man arose and put all the Servants to death which left him the only Surviving man on the island with eight or nine women and Several Small Children. He Immediately went to work tilling the ground so that it now produces plenty for them all and the[re] he lives very comfortably as Commander in Chief of Pitcairn’s Island. All the Children of the deceased mutineers Speak tolerable English, some of them are grown to the Size of men and women, and to do them Justice I think them a very humane and hospitable people, and whatever may have been the Errors or Crimes of Smith the Mutineer in times Back, he is at present in my opinion a worthy man and may be useful to Navigators who traverse this immense ocean, such the history of Christian and his associates”. Adams was reluctant to talk about the mutiny, but eager to find out what had happened in England. Folger told him about the important changes in Europe over the last two decades: the French Revolution, Napoleon’s rise to power, and the war against France. Describing England’s glorious victory in the Battle of Trafalgar in 1805, Adams rose and swung his hat three times over his head and called out: “Old England forever? Huzzah!” Unfortunately, Folger remained at Pitcairn for only ten hours. 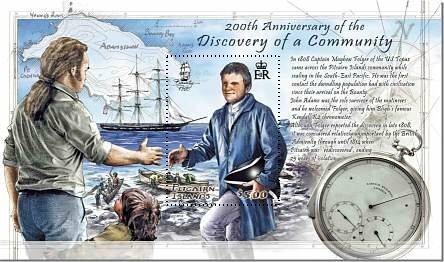 As a parting gift, Adams presented him with the Bounty’s azimuth compass and with the Kendall chronometer, which had served Bligh, and later Christian, so well. The discovery was reported by Folger to the Royal Navy 1808, a report of which reached the British Admiralty on May 14, 1809. The Admiralty considered the report unimportant and it was simply forgotten, although it was published in the Quarterly Review in 1810. 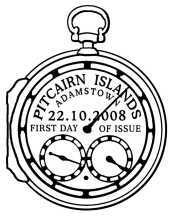 Pitcairn remained isolated until 1814 when two British warships, HMS Briton and HMS Tagus again “rediscovered” Pitcairn. 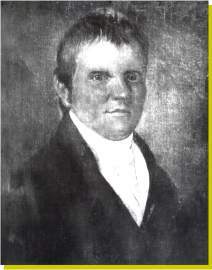 Captain Folger died on September 4, 1828, in Massillon, Ohio, without publishing his discovery. But his friend since 1800, Captain Amasa Delano, did publish what Folger had told him as part of his book A Narrative of Voyages and Travels (1817). Format: 1 single stamp in a horizontal miniature sheet. 22 October 2008 for a period of 2 years. 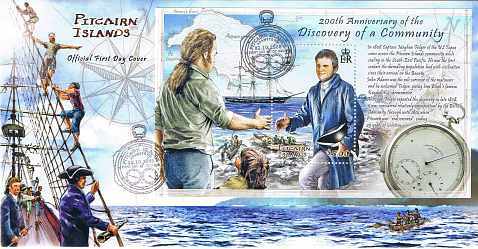 The Pitcairn Islands Philatelic Bureau wishes to acknowledge the support of Marie Henke of the Nantucket Historical Association, Massachusetts and Mandy Altimus Pond of the Massillon Museum, Ohio, in making this stamp issue possible. The image of Kendall’s K2 Chronometer was made available and is copyright of © National Maritime Museum, Greenwich, London.